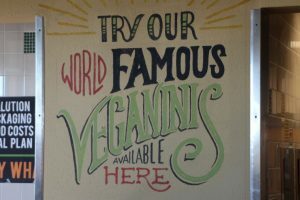 Mean Greens Cafe - Vegans Eat What? Vegans Eat What? We recently traveled to Denton, Texas to visit my wife’s sister and her husband. 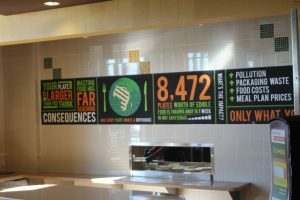 While there, we visited the University of North Texas’ (“UNT”) Maple Dormitory’s cafeteria “ Mean Greens”. UNT’s mascot is a “Mean Green” Eagle. 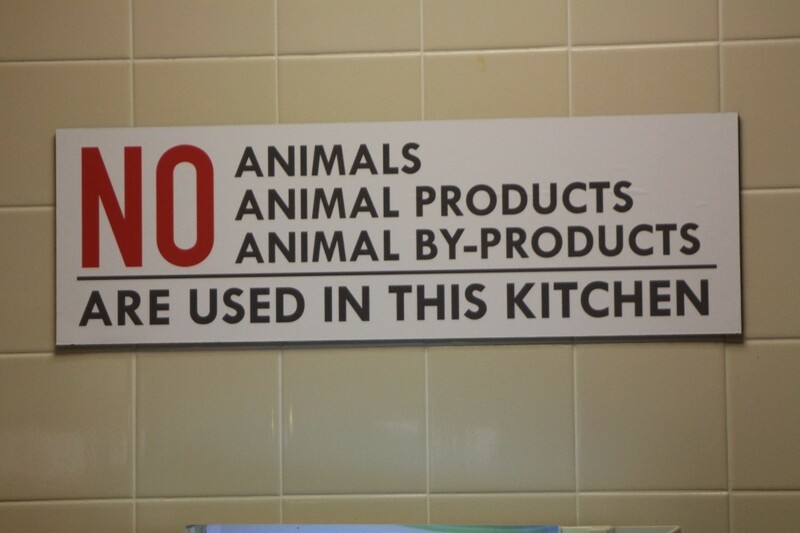 The cafeteria just celebrated their fifth anniversary of being a Vegan dining hall on October 14, 2016. 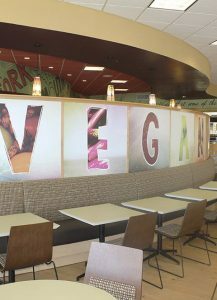 The dining hall is open to anyone who wants to enjoy delicious vegan dining options. The cost for a visitor is $8.12 per meal (including tax) for a plethora of choices and all you can eat! 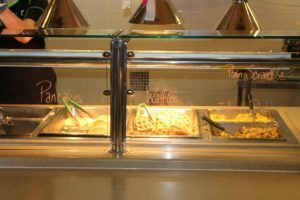 Student meal plans can be as low as $3.11 per meal! Even though it was breakfast, I had to take advantage of the vegan soft serve ice cream with both vanilla and chocolate flavors. (I noticed my table mates did as well – no judging!) Being a chocaholic, I opted for the chocolate. It was creamy, rich and not too sweet. The others reported that the vanilla was equally wonderful! So many times, vegan ice creams seem to rely on sugar for flavor; these did not. They are scrumptious. 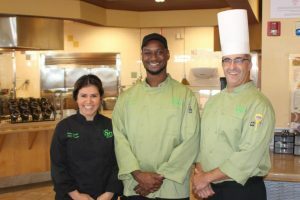 We commented on our pleasure of finding such a wonderful location to the cashier, who then introduced us to Chef Manager Carla Trujillo, Sous Chef Cris Williams, and Resident Dining Chef Scott Bullock, pictured left to right below. We skipped lunch (we’d had a late breakfast and were still stuffed) but returned for dinner. 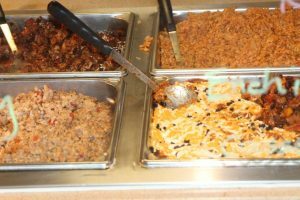 The dinner choices that evening included a taco bar, a wide selection of Latin foods as well as pizzas, pasta bars, a construct-your-own Vegan Paninis (Veganinis), an extensive salad bar, hot soups and dessert options (cakes, cobblers, baked apples and more). I again made multiple trips to the serving areas having some of the Mexican options as well as very tasty pizzas and pasta with marinara sauce. I did not do more than peruse the extensive salad bar, which was quite inviting. I finished with one of the variety of cake desserts offered. The rest of my party sampled a variety of menu choices; we were all delighted with our selections! The Chef Manager of Mean Greens, Carla Trujillo, mentioned that next year they will be adding an organic hydroponic garden and will use the produce in the production of the Vegan meals. In a follow-up email, she shared that the freight farm was delivered in early November and the seeding will begin during November, 2016! We were quite impressed with the overall approach and hope to see the concept spread to more universities. 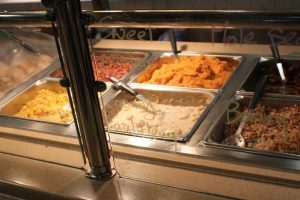 We were also delighted to learn that the Café uses various whole grains such as quinoa, freekeh, kamut, steel cut oats, barley, brown rice, amaranth and more, including at least one at each meal period. If you ever find yourself in or near Denton, Texas, make a point to visit the Mean Greens Cafe. The food is not only abundant, it is delicious and a delightful surprise for “cafeteria” or any restaurant food. The bar for food is clearly much higher than it was when we went to college! Glenn McCarthy was an avid competitive runner for over 40 years, running 15 marathons with an average finish time of 2:46. He is a certified coach with the Road Runners Club of America and has coached distance runners for many years using the Lydiard method. Glenn is a long-time vegan who loves to cook. He has two grown daughters and two grandsons and lives in Colorado with his wife who is also vegan.